Since I’ll be going abroad to study and won’t be bringing my own computer, I need some way to take my files with me and that means buying an external hard drive. I don’t have that many files, so any of the external hard drives that’s on the market today would be fine in terms of capacity. The main factors I considered was price, physical size, interface, and other features. After weighing the pros and cons, I decided to get a 2.5″ drive instead of the 3.5″ ones. 3.5″ drives have much better cost/GB, but they are heavier and need a separate plug while many 2.5″ can be powered by the USB connection. Interface-wise, the majority of external hard drives these days are USB 2.0. There are some that use eSATA, Firewire, or USB 3.0 which are all faster but are less common. For me, USB 2.0 is the most convenient, but I wouldn’t mind anything extra. Feature-wise, I want the drive to come with backup software so I can use the drive to backup my files. With this set of criteria, I started doing research and found that many manufacturers have products that fit the bill. At that point, all it came down to was price, and I ended up buying the Seagate because it was on sale. My budget was under ~$100 Cdn, and so I bought the 500GB model which sold for about $90 before tax. 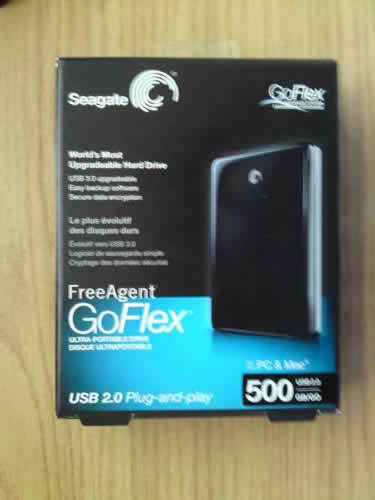 The box for the GoFlex 500GB. Sorry for the blurry photo. The pic was taken with my cellphone cam which doesn't have very good image stablization. The back of the GoFlex box, with the stats in no less than four languages. The GoFlex came in a average-looking small box with a picture of the product in front and the usual descriptions and stats on the sides and back. The packaging is certainly not Apple-quality, but it’ll suffice. The three pieces of hardware: the drive (left), the USB 2.0 interface adapter (top right), and the USB cable (bottom right). Inside, plastic packaging held three pieces of hardware along with a quick-setup guide and the warranty info. There is no driver/software CD, as all of the software is loaded into the drive. The three pieces of hardware in the box are the hard drive, a one foot long USB 2.0 cable (male mini USB to male type A) and the USB 2.0 interface adapter. 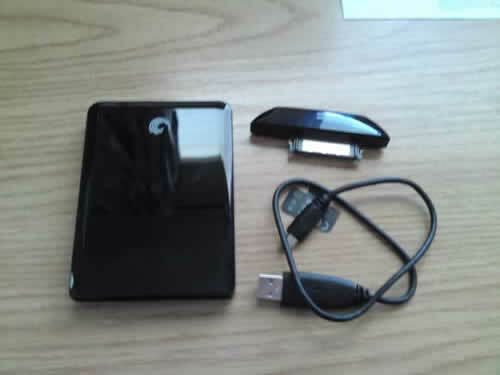 All the hardware is colored black to match and the drive and adapter have glossy plastic on the top and sides. The interface adapter has two white lights on the top. The glossy surface gives the device a shiny and sophisticated look when new, but the black color and glossy surface means that the drive is a dust and fingerprint magnet. The look is not a big deal for me though. The GoFlex series differentiates itself from the competition by having upgradable interfaces, and by default the drives are packed with the USB 2.0 kit. For $20-30, one can buy the adapter kits for eSATA, Firewire 800, or USB 3.0 and swap out the USB 2.0 interface. By inspecting the back end of the hard drive, you can see that the drive itself has a standard SATA interface, and the adapters just bridge that to another interface. I might think about upgrading the interface in the future, but for now USB 2.0 is all I need. Everything assembled and ready to go. 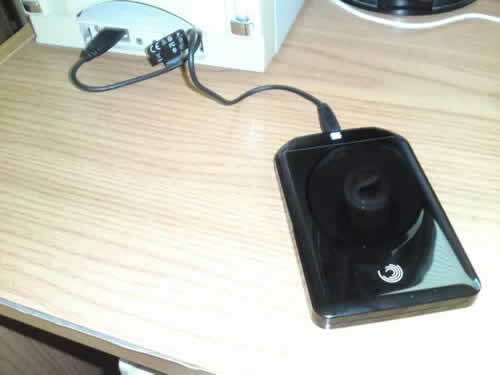 The GoFlex connected to my PC. Installing the drive was very easy. Just plug in the interface adapter into the back end of the hard drive and plug the cable into the mini-USB plug on the adapter. 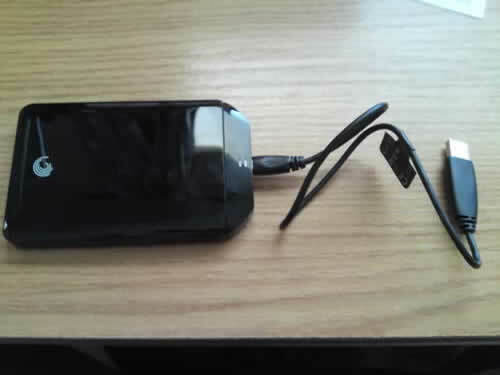 After that, connect the cable to the computer and the computer should automatically detect the drive as a mass-storage device. The software on the drive will then launch and prompt you to register the product and install the software. The main control/administration software is called Seagate Dashboard, but the backup utility is actually provided by Memeo. I have used Memeo’s backup software before (from a Buffalo LinkStation) and found it to be a decent program, so it’s good that the GoFlex comes bundled with it. However, the Memeo Instant Backup software is a little limited in terms of which folders it can back up, and I guess the point is to encourage people to buy the Premium Backup software. The Instant Backup software is enough for me though. The installer can also install trial versions of other Memeo programs, but I only needed the backup software. 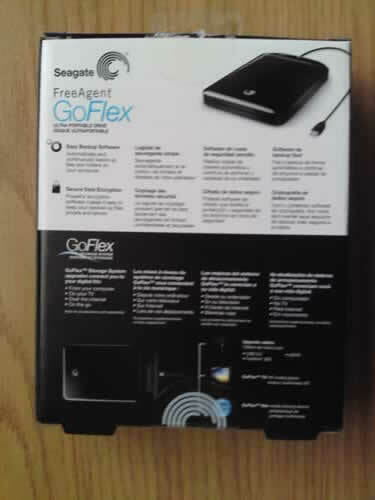 The GoFlex shows up as a new disk drive when connected. The drive comes with these files already loaded. Installing the software for the GoFlex. The drive comes with a full version of Memeo Instant Backup, but all the rest are trial versions. The Seagate Dashboard adminstration interface. The settings window from the Seagate Dashboard software. So far, I’ve transferred some files onto the GoFlex and it seems to be reasonably fast. I don’t have any numbers, but the hard drive is definitely faster than the no-name 1GB USB key that I use. I love how small and light the drive is and that it doesn’t need a plug. The possibly of upgrading the interface is a nice bonus too. Hopefully this drive will last for the next few years as I use it to transport and backup my files. Thanks for reading.